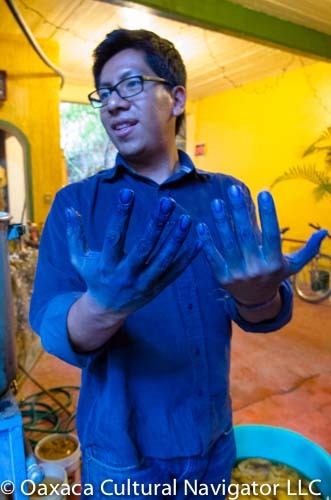 Writer Alex Szerlip came with us on the 2019 Oaxaca Coast textile tour to investigate and write about the purple snail dye that is on the verge of extinction. While she already knew so much in advance, we took her to the source: the Mixtec village of Pinotepa de Don Luis to meet the few remaining dyers who hunt the snails and color native cotton and silk. The article she wrote, Vintage Tech: Tyrian Purple, was just published. I hope you click the link to read it. Caracol purpura is also called tixinda in the Mixtec native language. 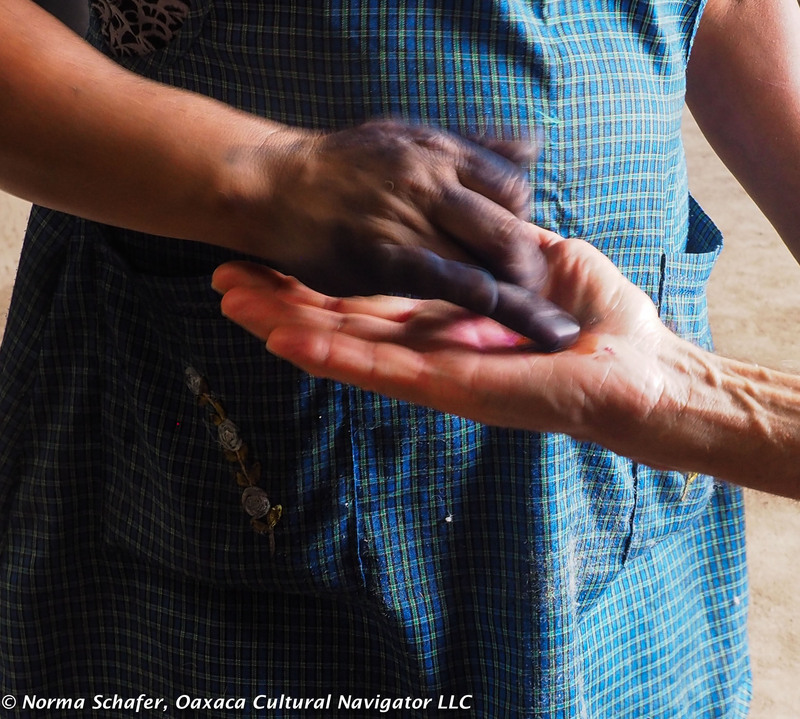 Mexican Dreamweavers Cooperative, a not-for-profit organization started by immigration attorney Patrice Perillie, helps support the tixinda dyers and weavers. Patrice has started a GoFundMe effort to help with expenses to get the cooperative to the famed Santa Fe International Folk Art Market in July 2019. Groups are juried for acceptance and competition is stiff. 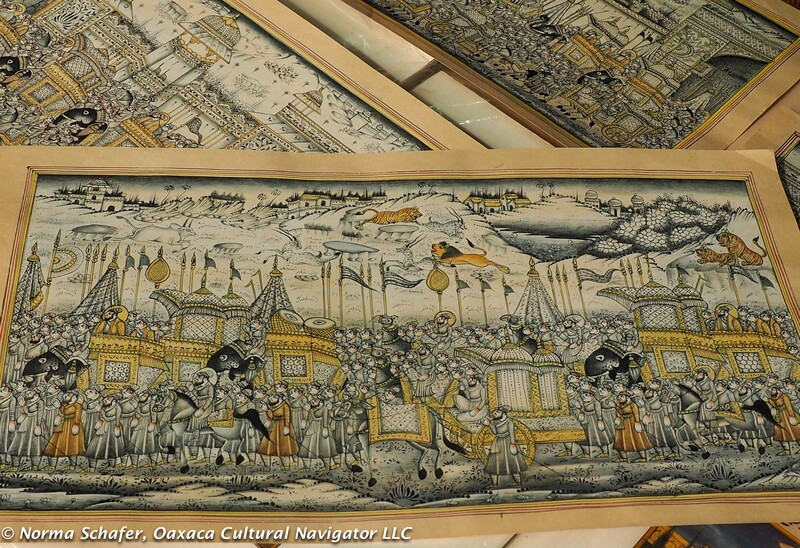 Help Mexican Dreamweavers raise $4,000 USD to attend the Santa Fe International Folk Art Market. Can you help? Contact Patrice Perillie. 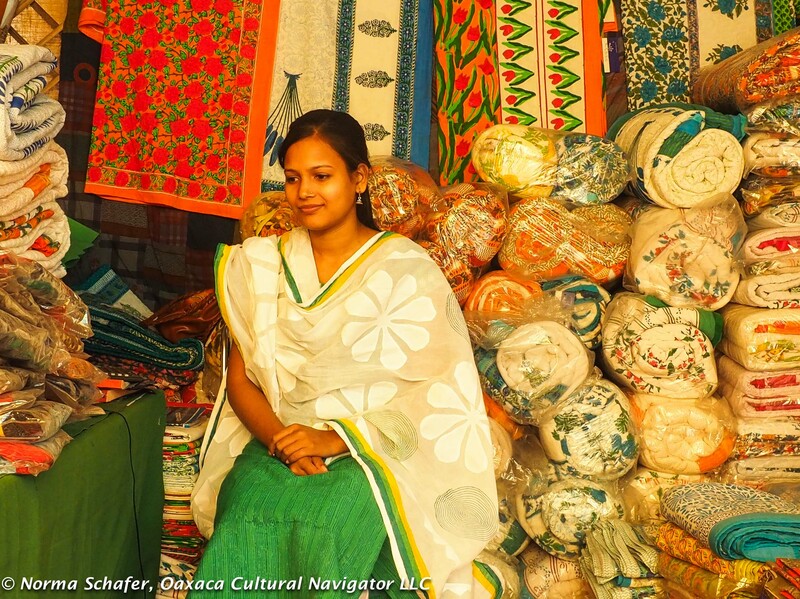 Mexican Dreamweavers is a USA non-profit, so your gift is tax-deductible. This is the most enjoyable and enlightening article on tixinda I have ever read. Thank you for mentioning our work from the bottom of my purple heart…. I will personally read it to Habacuc and Rafael when I see them this weekend! They will be thrilled! Habacuc and his son Rafael are just a few of the dyers remaining who make the journey and climb the treacherous rocks of Huatulco to harvest the purple snail. Their technique preserves snail life and habitat. What I appreciate about this article is it’s first person narrative, sensitivity and understanding of the work of indigenous people on Oaxaca’s Costa Chica. With environmental and aesthetic perception, Alex Szerlip conveys the cultural and historic importance that purple dye has to the Mixtecs on Oaxaca’s Pacific Coast. Of course, the color purple has been regaled by emperors and kings for centuries, rare and beautiful. 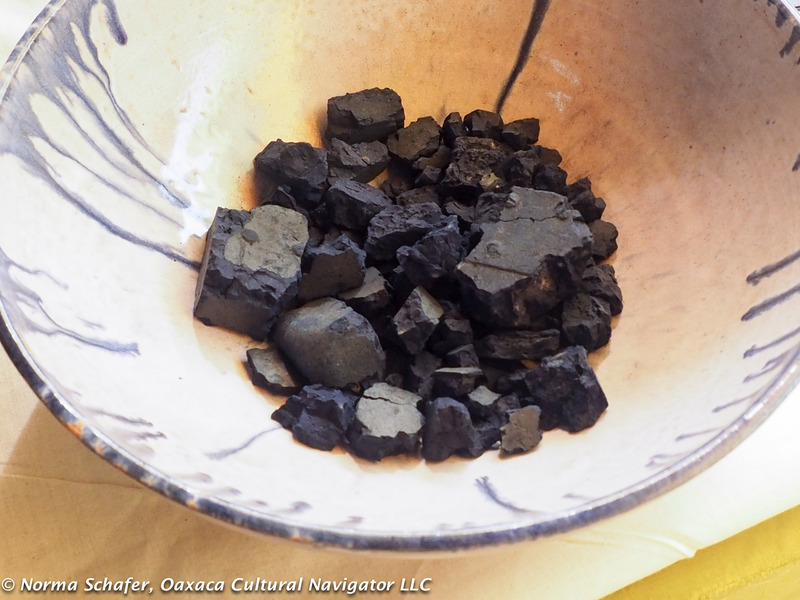 Now, nearly extinct around the world, Oaxaca is one of the last bastions for preservation and hope, thanks to applied anthropologist Marta Turok Wallace. 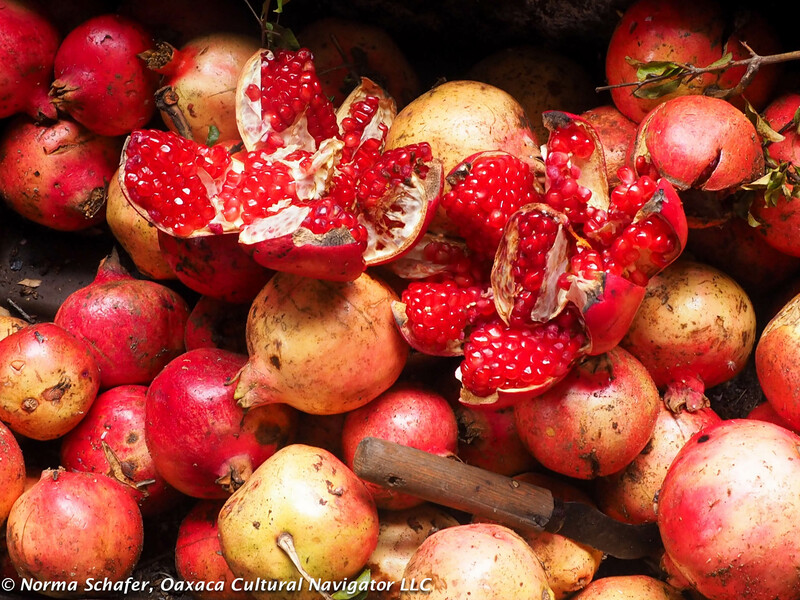 This post is a tribute to her and the people of Oaxaca who are dedicated to sustaining this living tradition. 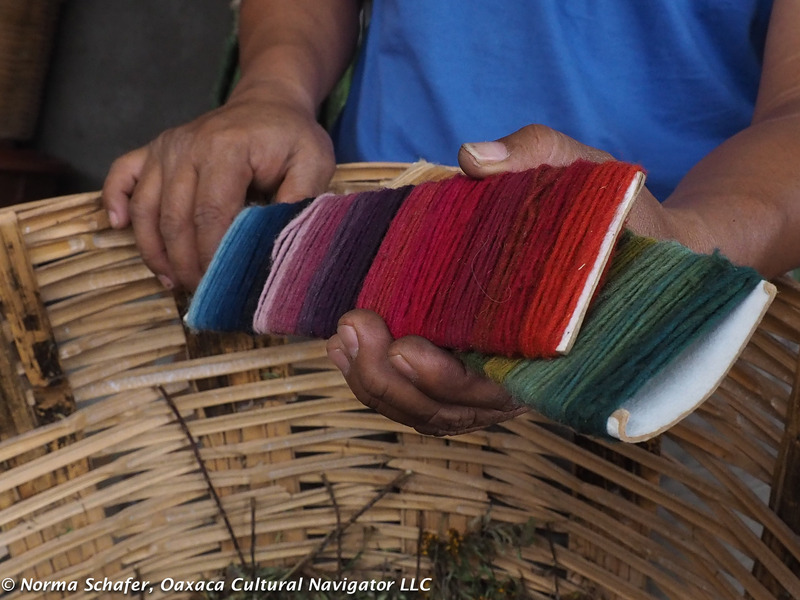 Note: Oaxaca Coast Textile Study Tour, January 18-27, 2020, is almost sold-out. We have two spaces open. Don’t hesitate if you have been thinking about this! We visit the Dreamweavers Cooperative in Pinotepa de Don Luis as part of this adventure. Special thanks to cultural anthropologist Denise Lechner who guides us into remote villages to meet the makers. So, you are coming to Oaxaca for Day of the Dead! 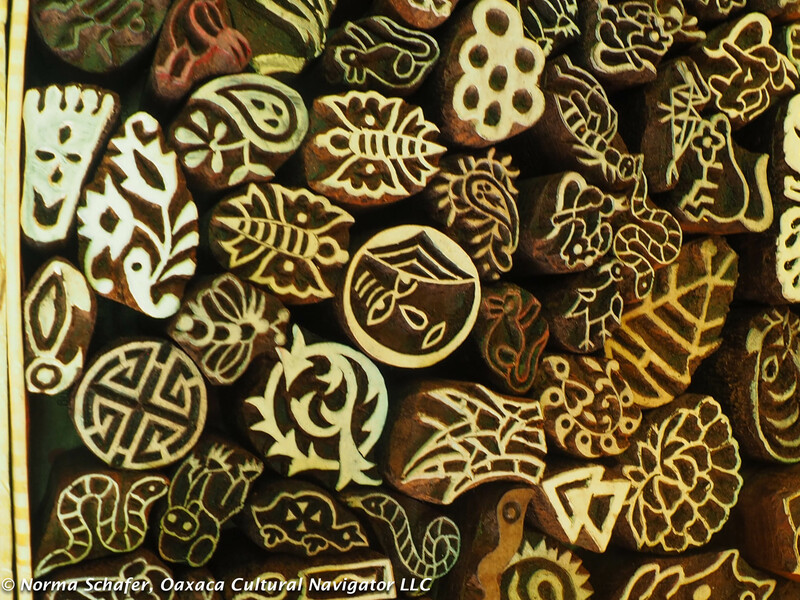 Here is a chance to get beyond the sugar skulls and cemeteries, the masks and parades, and go deeper into the natural dye traditions of our wonderful region without leaving the city of Oaxaca. Blue hands, mark of distinction! 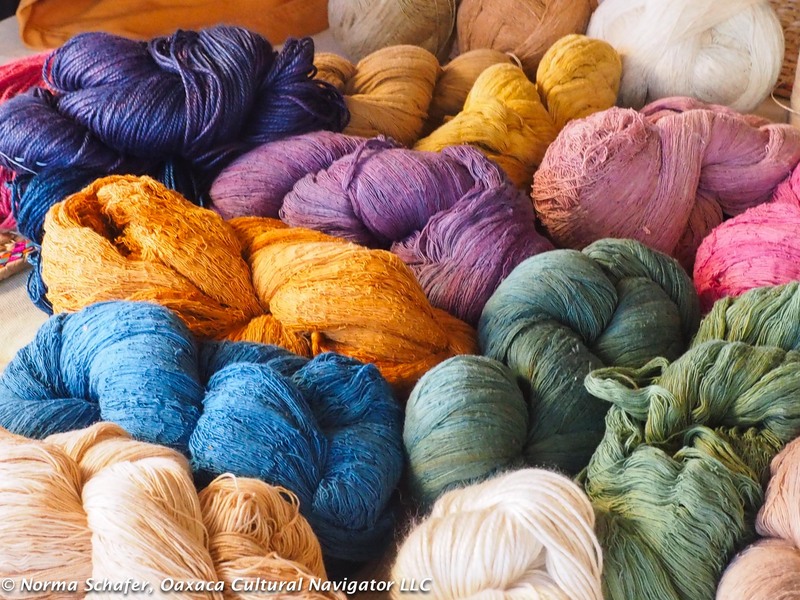 Natural dyes have been used by indigenous people of Oaxaca to color wool, cotton and silk for centuries. It thrives today among a small group of local artisans dedicated to preserving cultural history. 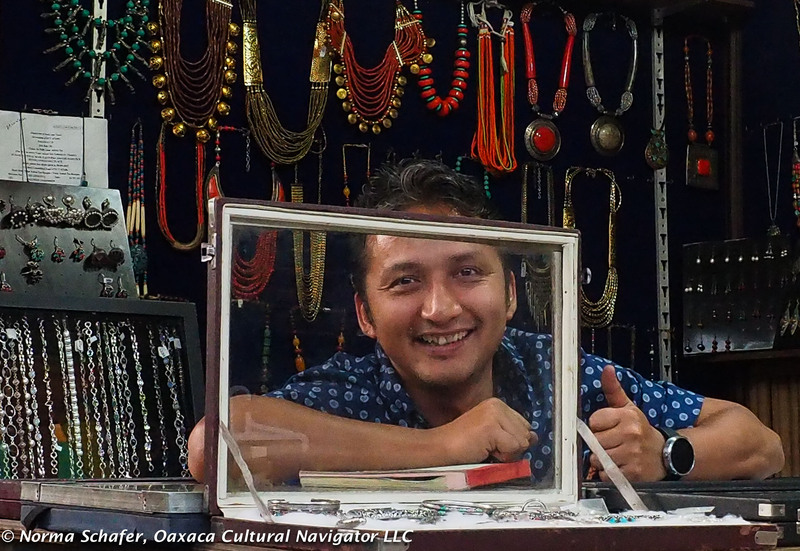 10 a.m. to 3:00 p.m.
We are based in a Centro Historico neighborhood within walking distance (about six city blocks) from Oaxaca’s Zocalo — downtown plaza. 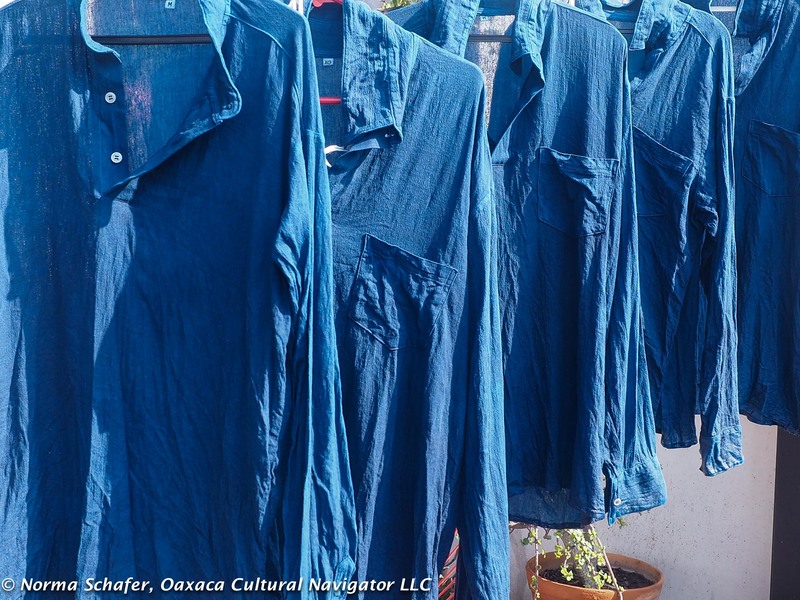 The hands-on workshop includes 10 hours of instruction to learn about Oaxaca´s natural dye traditions, materials and techniques used in the Central Valley of Oaxaca. The workshop focuses on understanding how the chemistry of natural dyes act on the protein fibers (we use wool), and how this can be reproduced in your home or studio using local materials. 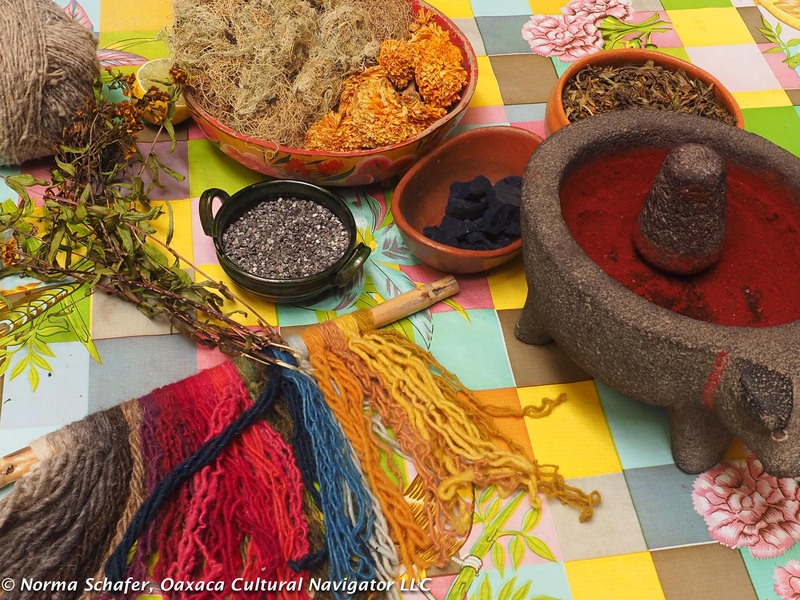 The workshop includes cochineal, indigo, pomegranate, marigolds, and brazilwood to create 16 different colors. Participant will receive recipes and put together a sampler of each natural dye color created on hand-spun 100% churro sheep wool. We will send you an invoice to pre-pay with PayPal. When we receive funds, we will confirm your registration and send you instructor contact information, and a map. The workshop includes instruction, all materials, recipes and the sampler. It does not include beverages, snacks or lunch. We suggest you bring your own if you get thirsty or hungry. 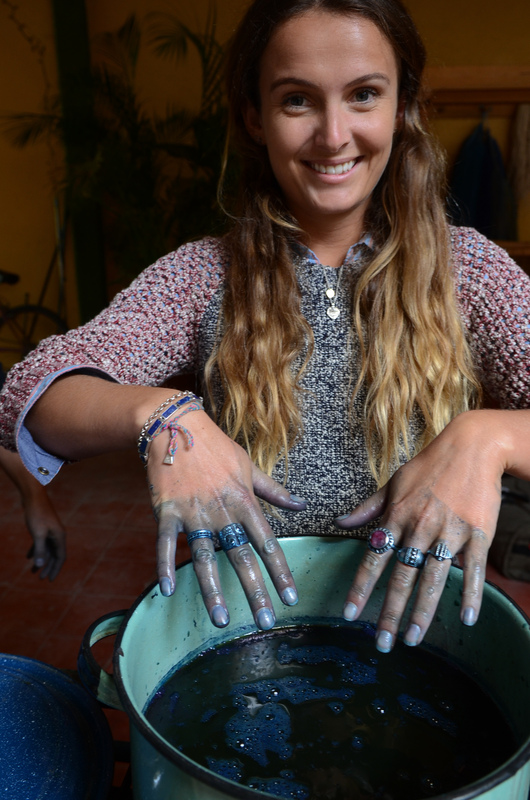 We hold the dye workshops on the rooftop terrace of a home located in the City of Oaxaca, only 10 minutes walking from the main square of the capital. 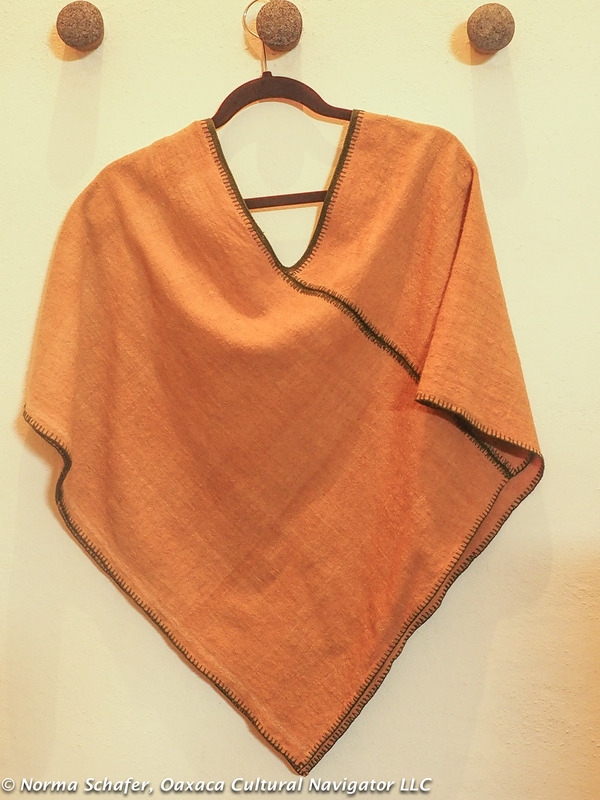 The studio was founded by two artisans, wife and husband, who are committed to preserving natural dye traditions. The wife is a native of Oaxaca City. 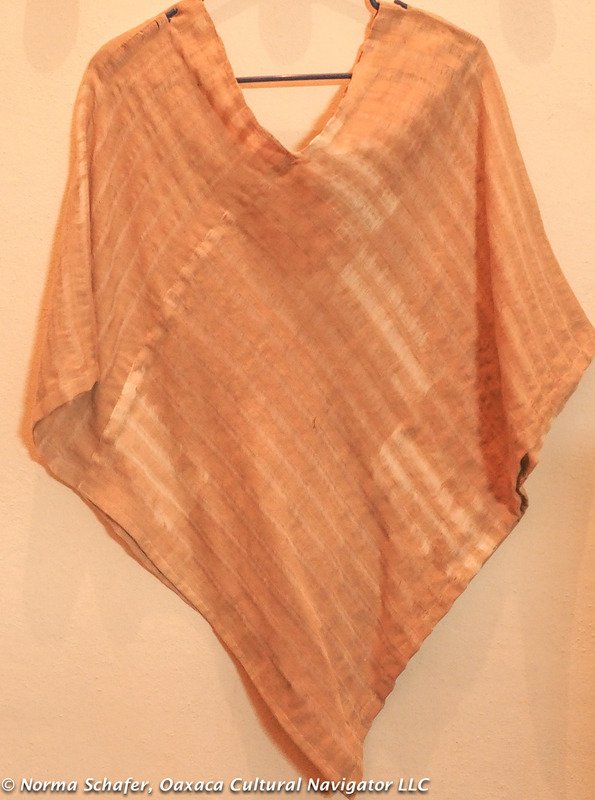 The husband is a fourth generation member of a family of weavers and dyers in Teotitlan del Valle, Oaxaca. Both are bilingual, speaking Spanish and English. 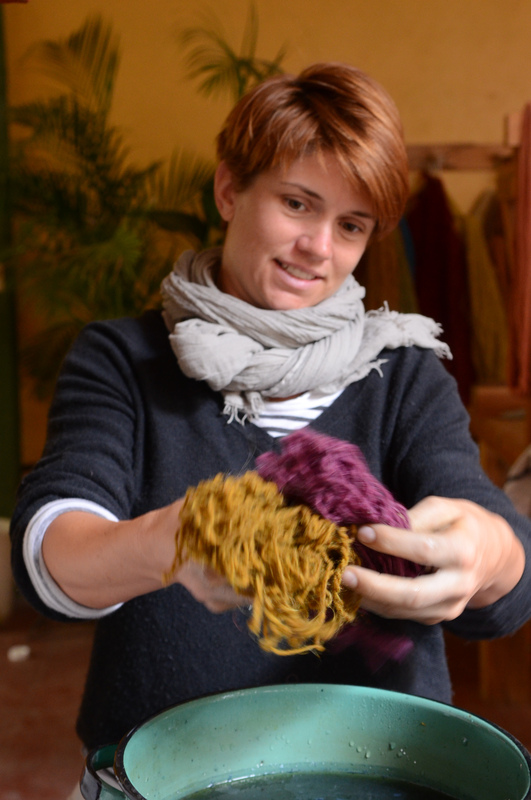 For the last 12 years, the couple has focused on natural dyeing processes and traditions. 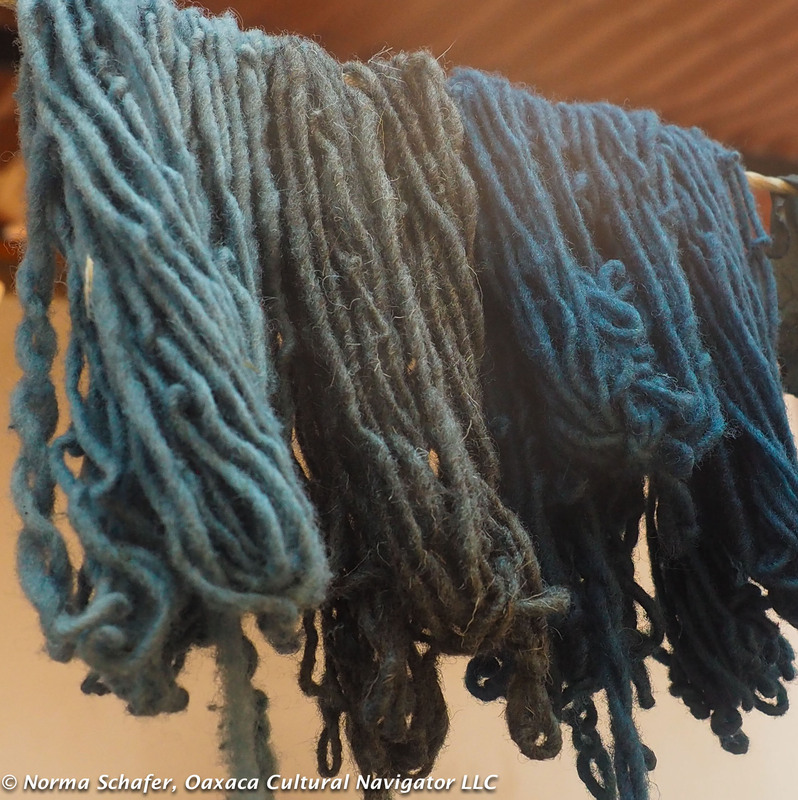 Their experience includes researching local indigo and cochineal, collaborating with local and international dyers, experimenting with recipes and testing fastness of the colors on both protein (wool, silk) and cellulose fibers (cotton, linen, hemp). 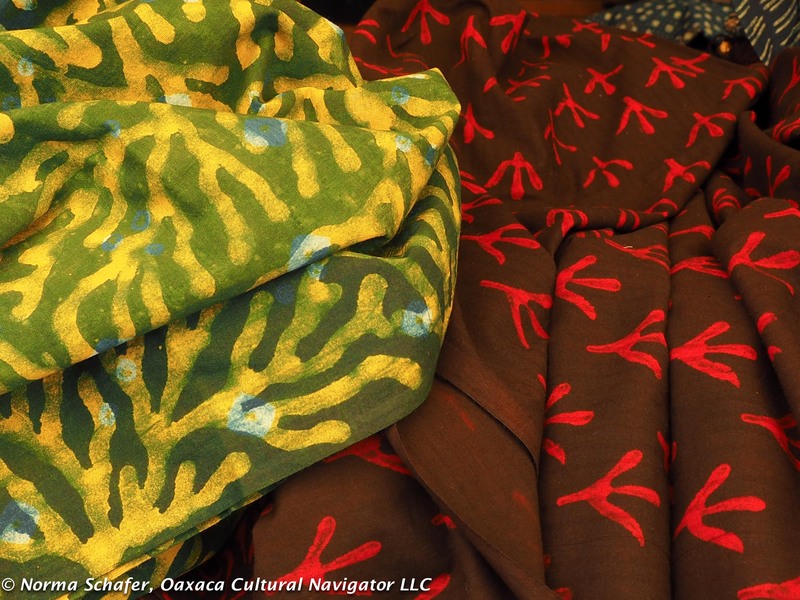 Both have taught dye workshops in universities, cultural centers and museums in Mexico, the United States and Europe. 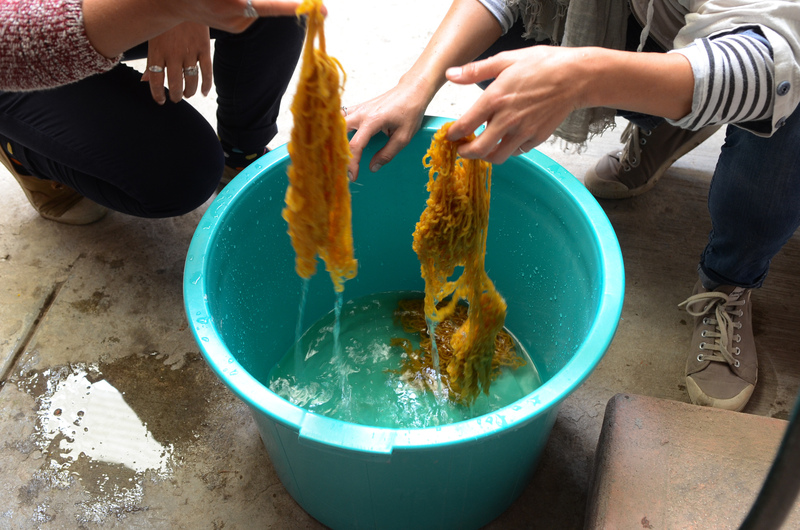 Currently, the studio provides the service of dyeing fibers for local artisan weavers and teaching workshops. 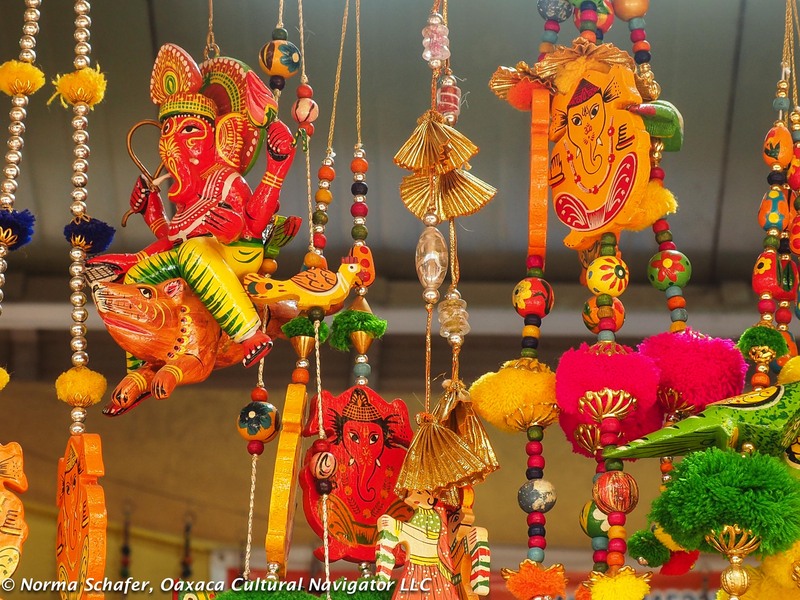 Nature Bazaar is an effort by the Delhi Department of Tourism to bring the best artisans from throughout India to the city for permanent exhibition. Or, let me say, the space is permanent and the artisans rotate. So, it’s more of a pop-up and the artisans change about every six weeks. This group goes until November 30, 2016. I returned on my own so I could leisurely browse the textile collection, speak with the makers, and go through the stacks of cloth in search of indigo blue, red madder, turmeric root dyed yellow cloth. I didn’t want to miss anything. This extended to a three-hour meander to uncover as much as possible. 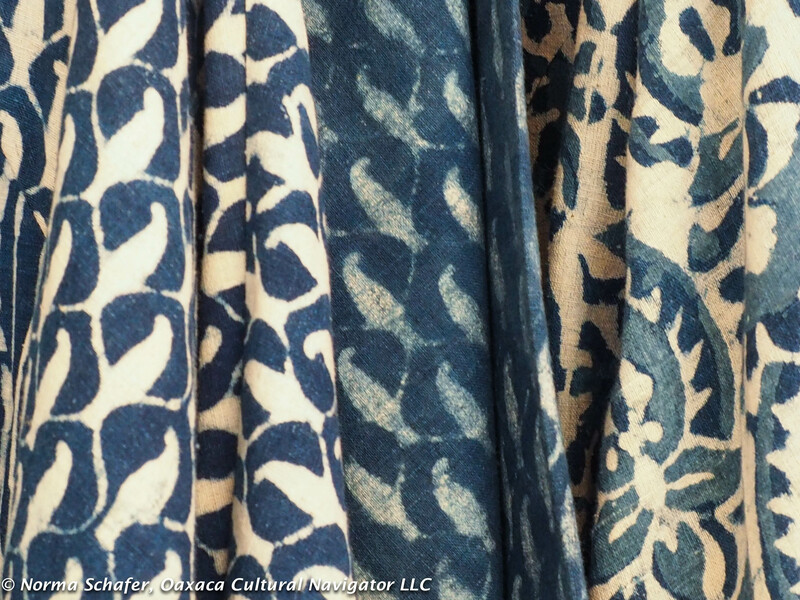 Block print yardage, turmeric w/ indigo over-dye (L). Madder w/indigo over-dye (R). My textile artists friends tell me that the Nature Bazaar cooperative is the best source for India arts in Delhi. Funds from the purchases go directly to the artisans who participate. My friend Lee Schwartz, who just returned from a 10-day tour of Rajasthan, claims she saw nothing of the quality on the tour that she encountered at the National Crafts Museum in Delhi. After a visit there, today, I still rank Nature Bazaar as the top shopping spot in Delhi, with second place going to FabIndia. 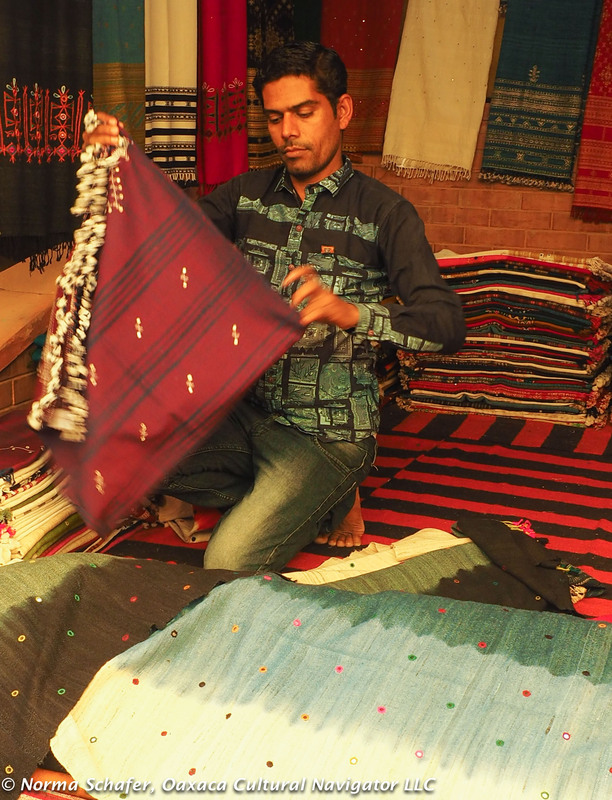 Ahmedabad artisan folds shawls inset with mirrors embroidered to silk/wool blend. As with Oaxaca, it’s important to know where to source. I’ve decided to focus this India visit on textiles and not on typical sightseeing and monuments (though tomorrow we leave for Agra and the Taj Mahal). There is so much here that zeroing in on what is important to me helps conserve energy. It’s impossible to get to more than two or three places in a day because of the intense traffic, horn-honking and dust. It just wears you out! 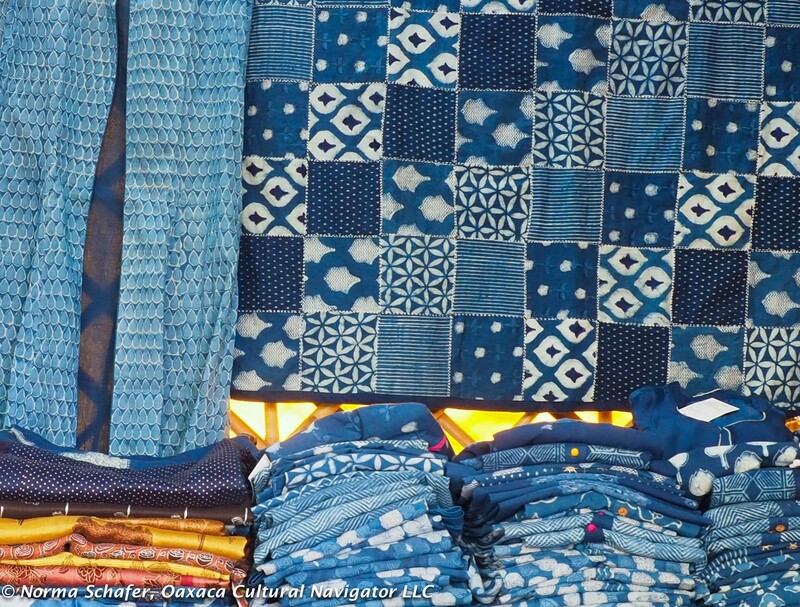 Indigo dyed patchwork quilt, with dresses, blouses on table. At Nature Bazaar, I met Margaret Zinyu, who has a degree from the National Institute of Design in Ahmedabad. She planned to go into fashion design but decided to return to her native Nagaland, in northeast India on the Myanmar border, to work with local weavers using cotton dyed with indigo. 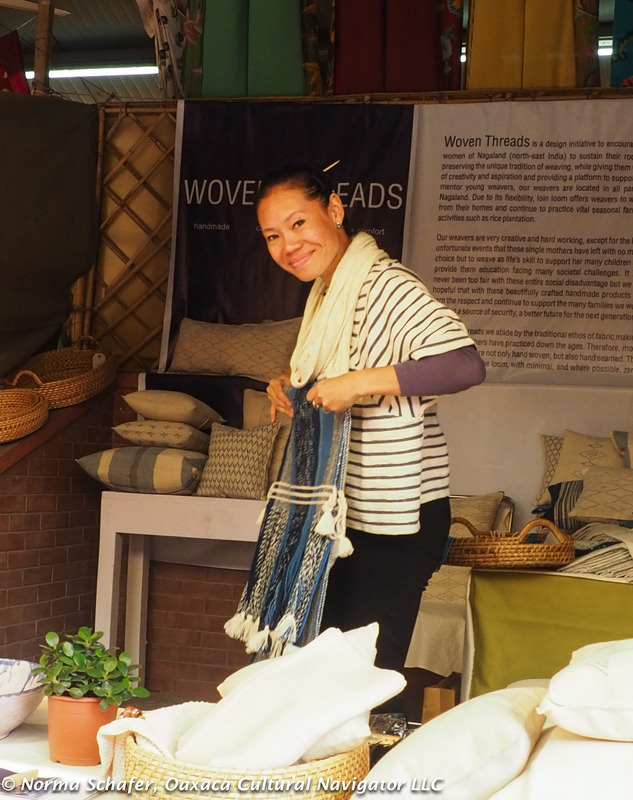 She is just starting her company Woven Threads and this bazaar was the premiere of her products. 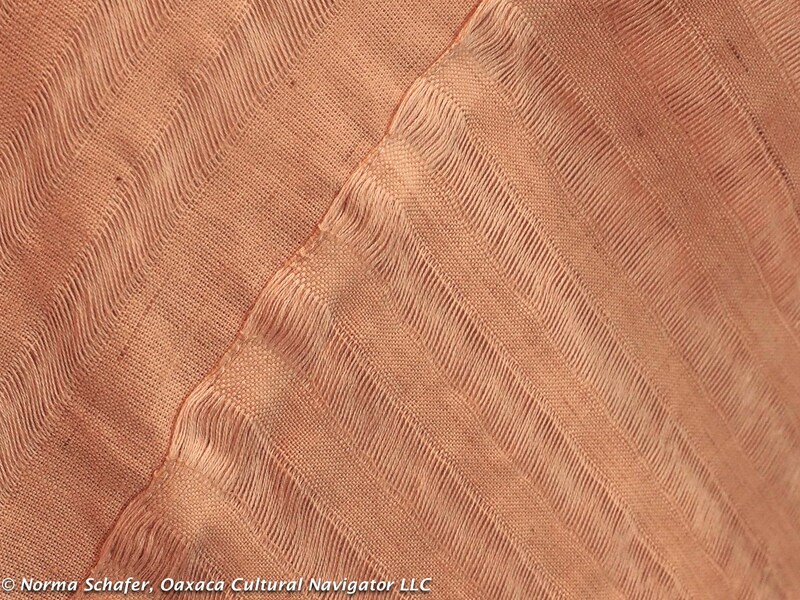 India is at the crossroads of the ancient Silk Road. The people here are a multicultural blend of Asians and Europeans, Hindus and Muslims. There is as much diversity here as I see in Mexico. The people from the Himalaya foothills, part of India, bring their kite flying traditions to the crafts of the country, for example. These are for sale at the Nature Bazaar, too. There are also several stalls with hand-wrought silver jewelry from the Himalayas and Afghanistan. Many of the designs looked North African, like those I had seen in Morocco and southern Spain. Tribal jewelry maker from Himachal Pradesh in the Himalayan foothills of India. 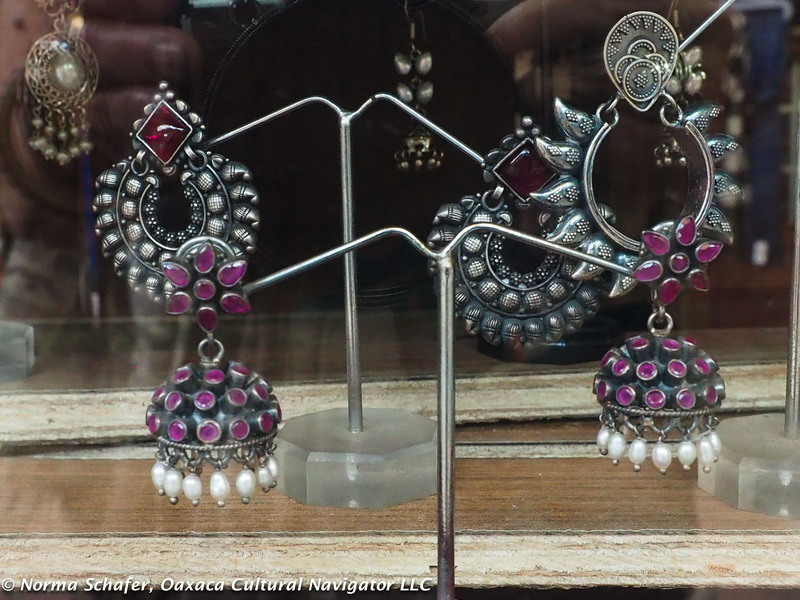 Example of ornate silver earrings inlaid with garnets and embellished with pearls. There is no cochineal here, of course. This is a humid country and the insect is only found in hot, dry climates like Mexico where the nopal cactus thrives. So madder, the red dye that is more the color of red earth than intense carminic red, is what is found here. However, indigo is king in India and the British capitalized on its export starting in the early 17th century. Today, it is only cultivated in Tamil Nadu in the south of the country. 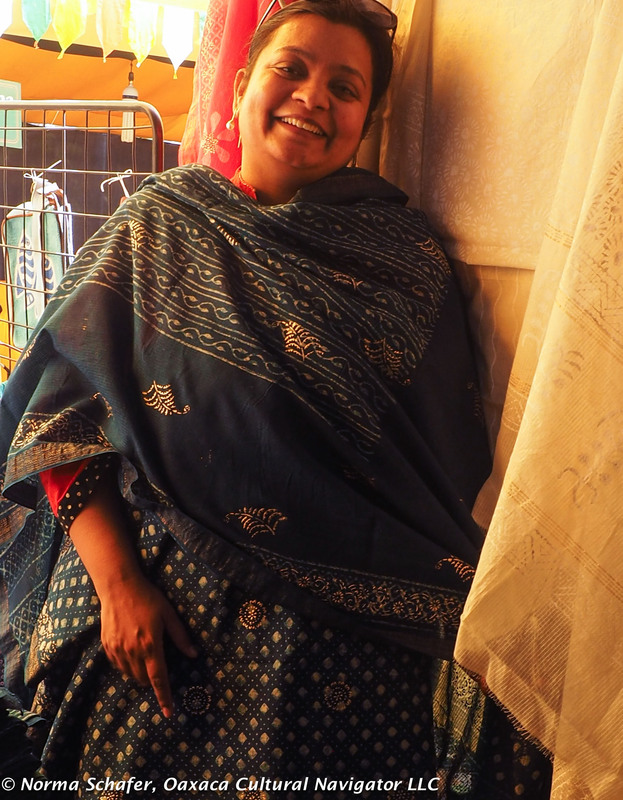 Walking the streets and riding the Metro, I see women of all ages wearing saris and the shalwar kameez pantsuit with tunic top and harem-style pants dyed with indigo blue. Women’s clothing of India is beautiful, lightweight and easy to wear. Mexican indigo is extracted from the native plant Indigofera suffruticosa, known as añil, found in the tropics of the Americas. 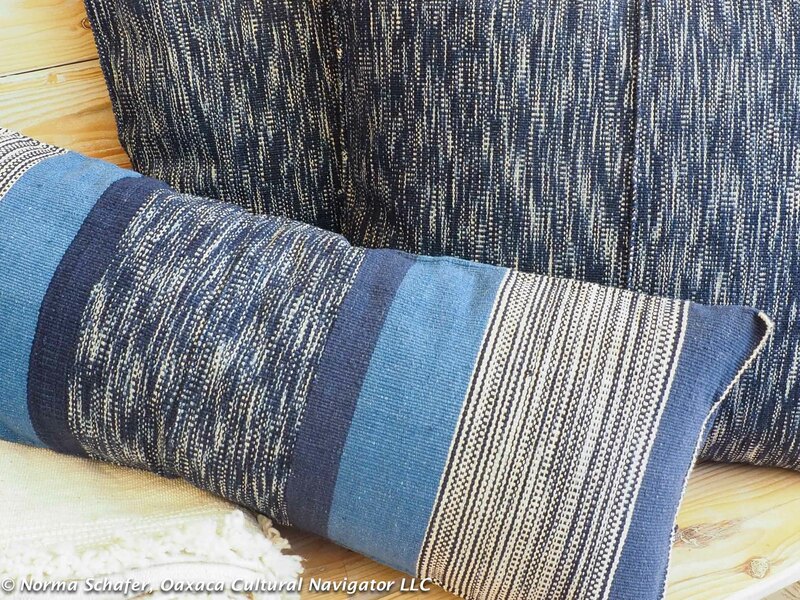 Native indigo from India is Indigofera tinctoria, known as true indigo, and is found in Asia and Africa. 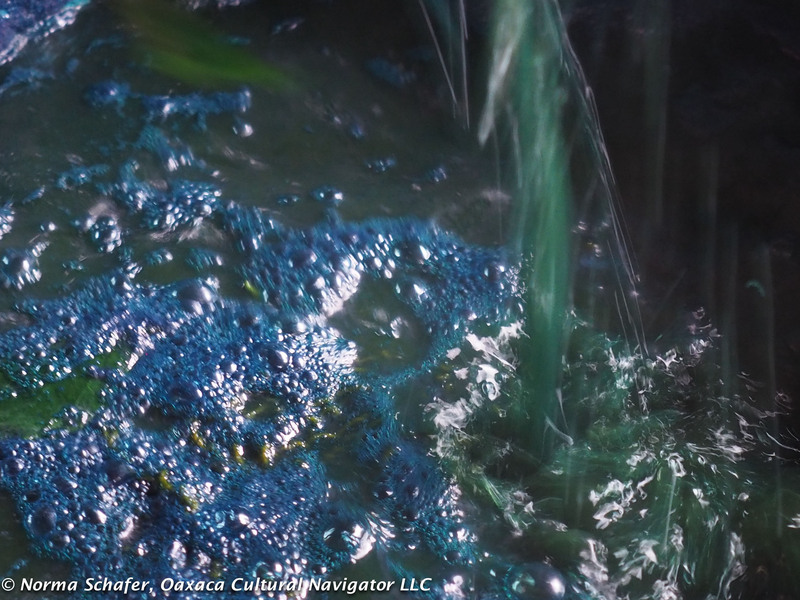 The plant and leaf structures are different, but the process to produce the color is the same. 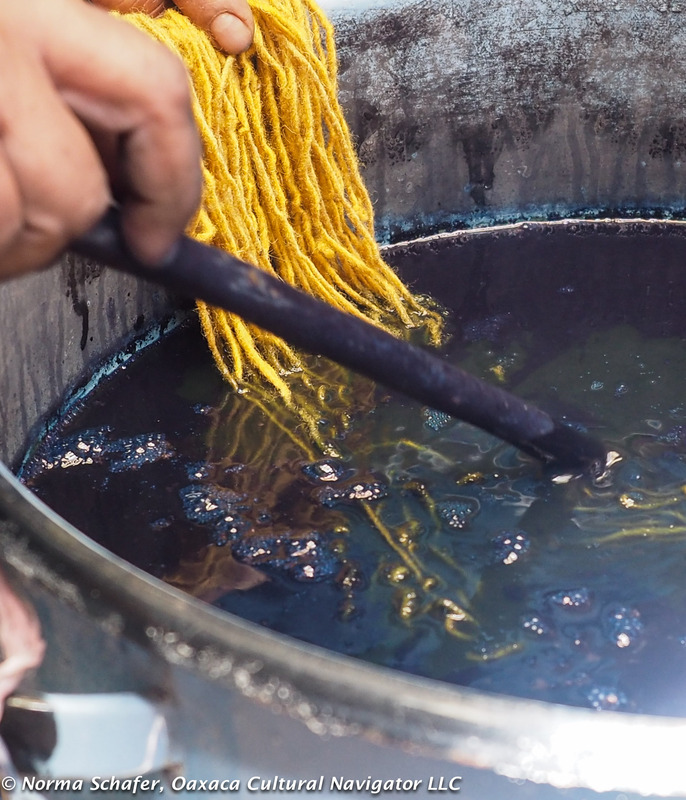 The most intense blue comes by dipping the cloth at least several times in the indigo dye bath. 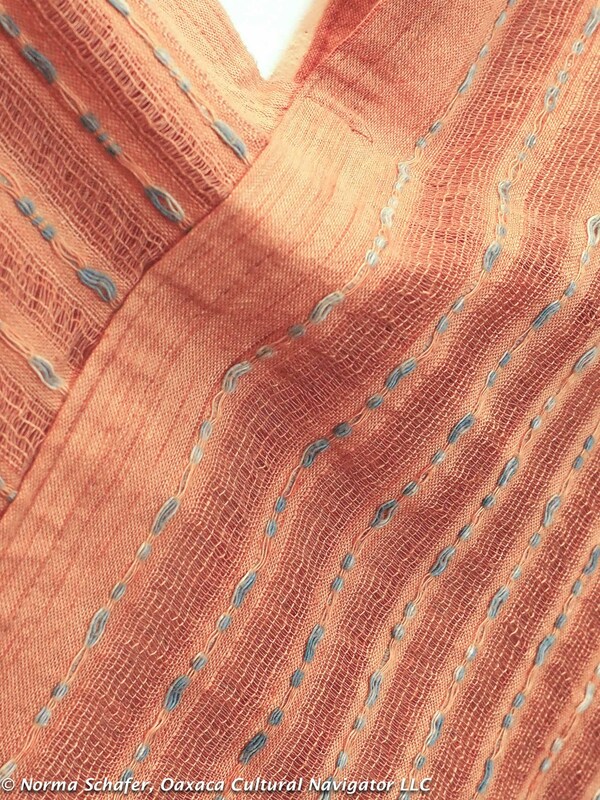 My goal on this trip is to bring back examples of of cloth dyed with indigo, using a variety of weaving, tie-dye and printing techniques. It’s a 24-hour flight from California to New Delhi, not including the layover in Tokyo. I’m getting ready for a month of travel, focused mostly on the India State of Gujarat, with my Canadian friend Fay Sims, leaving San Jose on November 15.
to discover who knows what else! My friend, master weaver Federico Chavez Sosa, asked me to bring him back a chunk of native India indigo to experiment with. My friend, master weaver Alfredo Hernandez Orozco, asked me to bring him any type of native India fiber to experiment with on his flying shuttle loom. They are innovators. I am going with one empty suitcase, the second half-full. 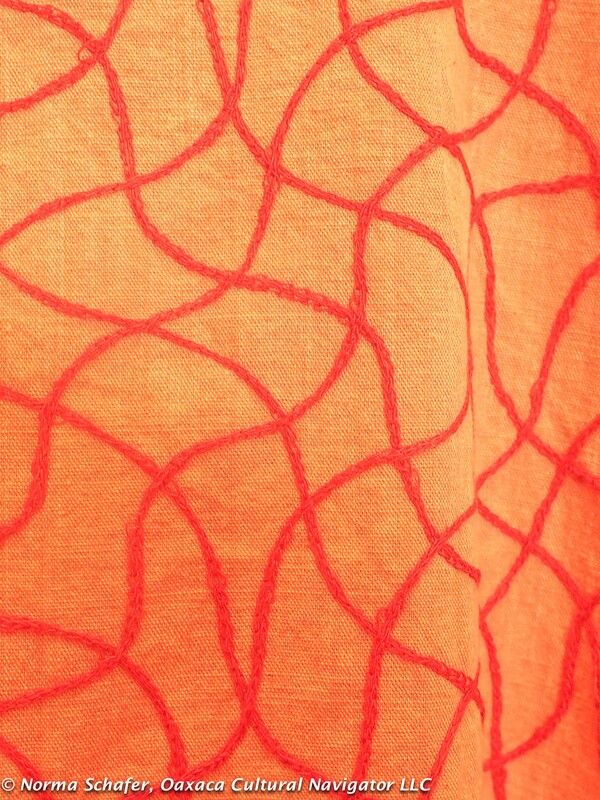 What advice do you have for me on the quest for India textiles with natural dyes in New Delhi, Gujarat state and Mumbai? 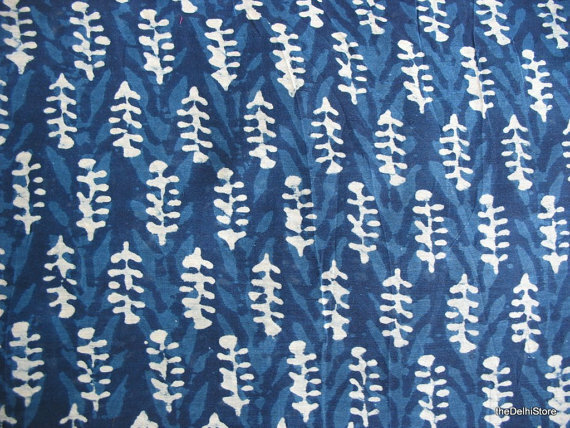 Example of indigo block print from India, on cotton and silk cloth. 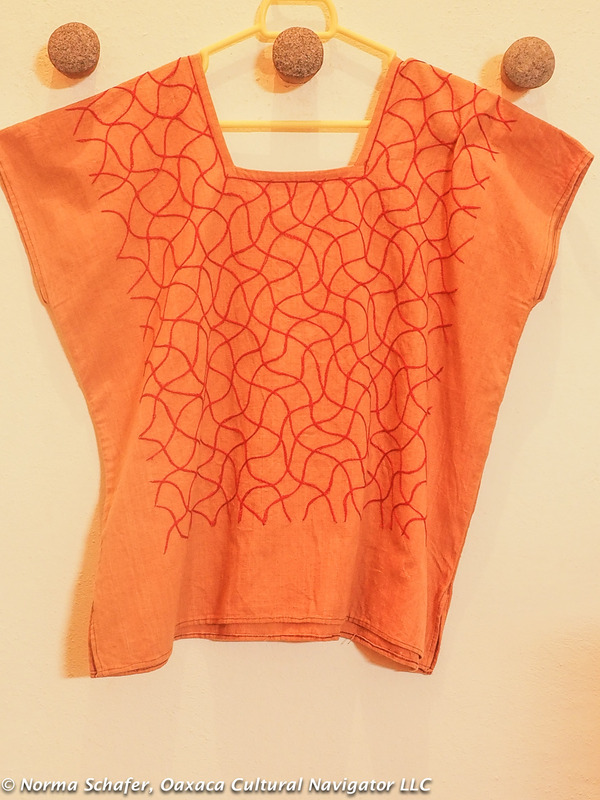 This pop-up clothing sale features the indigenous Mexico short poncho or triangular bodice cover-up called a quechquemitl in the Nahuatl language, used by pre-Hispanic women throughout the country. It’s my favorite accessory and that’s why I have too many of them! Slip one over your head, and your shoulders and bodice are covered beautifully, even if you are only wearing a tank-top or halter. It’s a one-piece scarf, too, that never falls off! 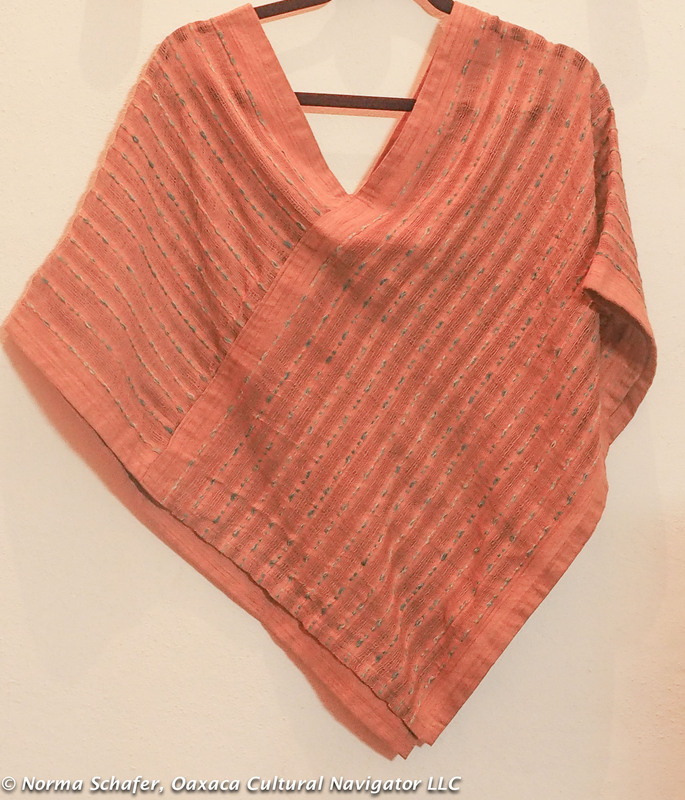 Here I am offering — in like-new, rarely worn condition — some beautiful indigenous clothing made by women and men in Oaxaca villages, most made with natural dyes, some hand-spun native cotton. 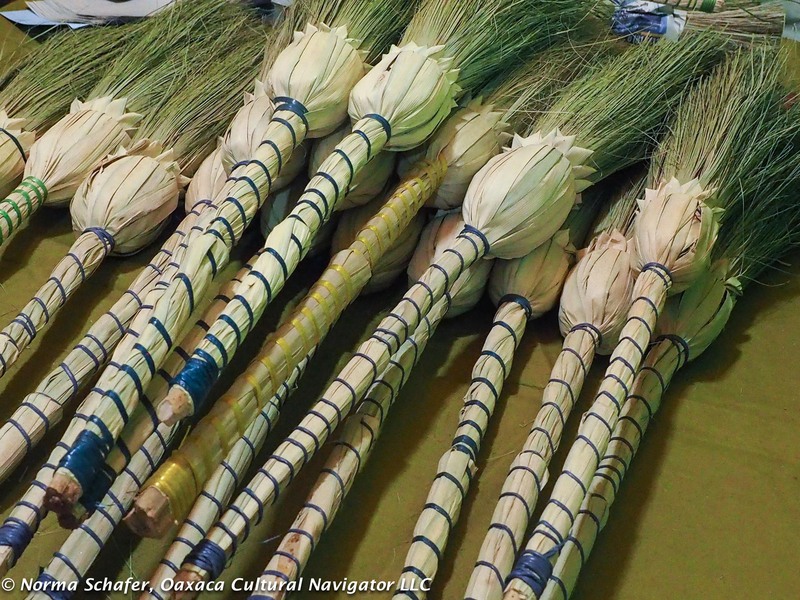 As you might expect, they are from some of Oaxaca’s finest weavers, dyers and designers. All prices include shipping within 48 U.S. states! Send me an email and tell me which piece(s) you want. I’ll email you a PayPal invoice. Purchases must be made by June 30. I will ship from Santa Fe, New Mexico after July 7. 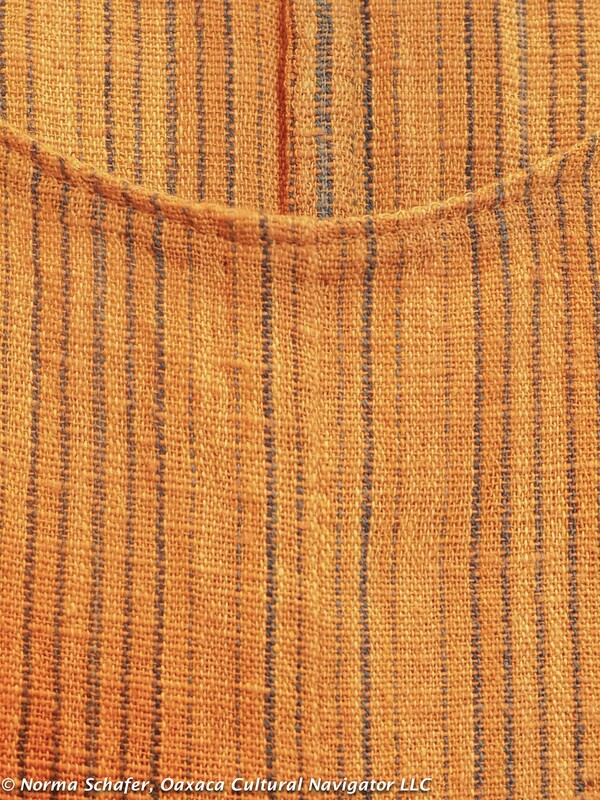 Coyuchi Cotton Quechquemitl (above) handwoven in the village of San Sebastian Rio Hondo on the back strap loom by Khadi Oaxaca. Color is a warm caramel. One size fits all. $125 USD. Note about coyuchi cotton: This is rare, wild native cotton grown in the high mountains of Oaxaca that separates the valley and the coast. 2. SOLD. 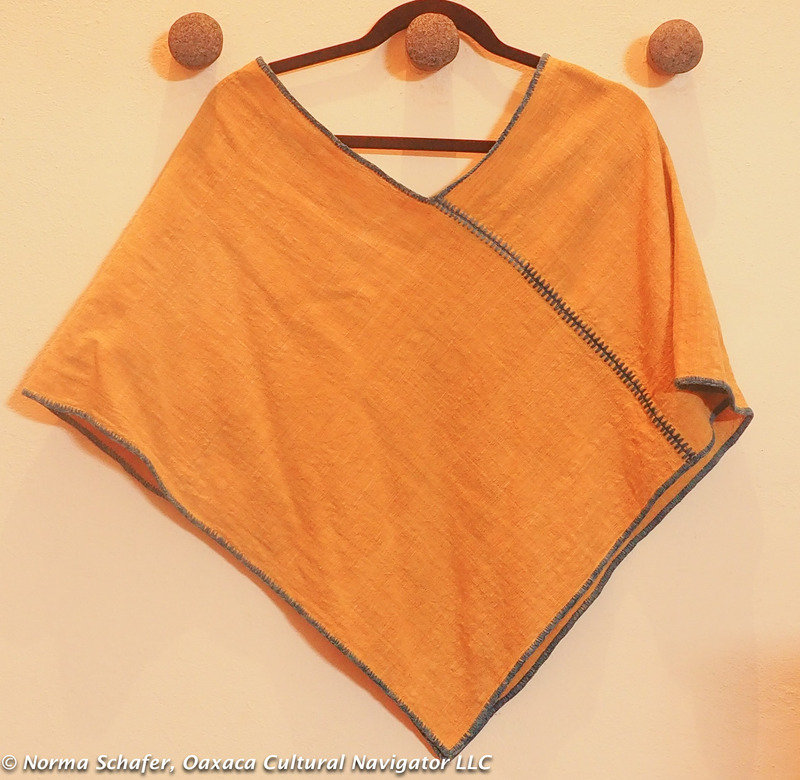 This pericone (wild marigold) dyed quechquemitl (below) is exactly the same style as the one above, made in San Sebastian Rio Hondo by Khadi Oaxaca. It is golden-yellow and the hand weaving shows the variegation of the process. One size. $145 USD. 3. Below. Pericone/indigo/coyuchi dress, size M/L. I made a pattern from a favorite Dosa dress and have sewed it multiple times with French seams, patch pockets, and lots of designer detailing and hand stitching. 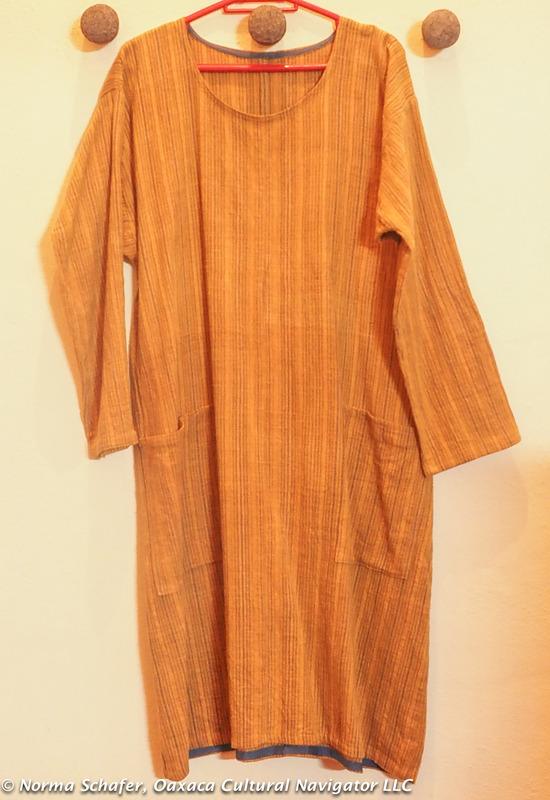 For this dress, I bought hand-spun cotton fabric from Khadi Oaxaca that is hand-woven and dyed with wild marigold, indigo and integrates native coyuche cotton. $165 USD. Here is the full dress below. 4. 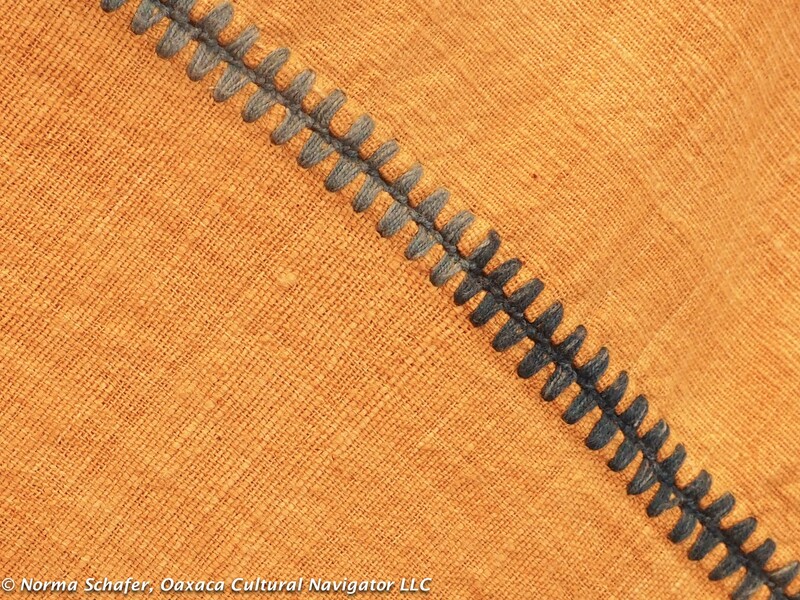 Alfredo Orozco nut-dyed quechquemitl, below, is woven on a flying shuttle pedal loom in the deshillado technique, which means there is an open-weave. You can see the detail in photo 4B. This one is more pale beige than brown. Touches of cream-colored ikat add interest. One size. $85 USD. 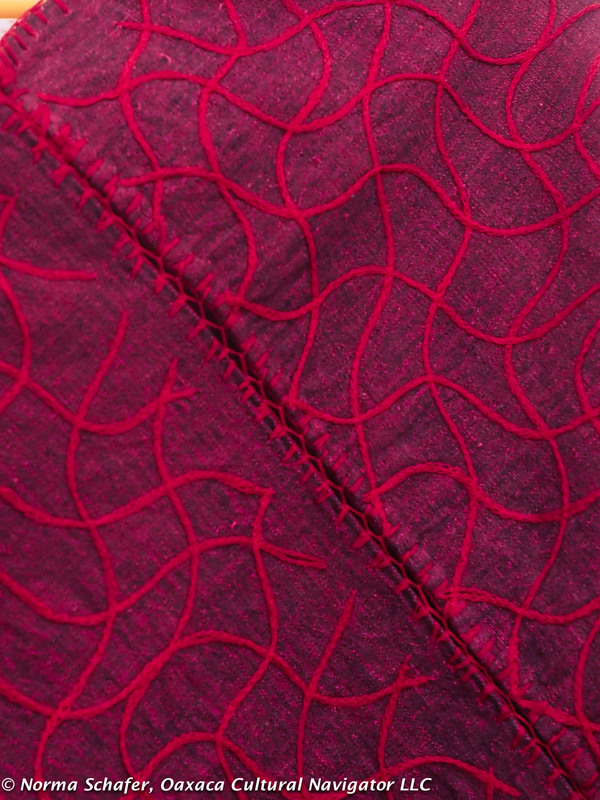 Below is the weave detail of the fabric above. Finish work is done by Alfredo’s wife Veronica on the sewing machine. 4B. Orozco beige quechquemitl detail with open weave. 5. SOLD. 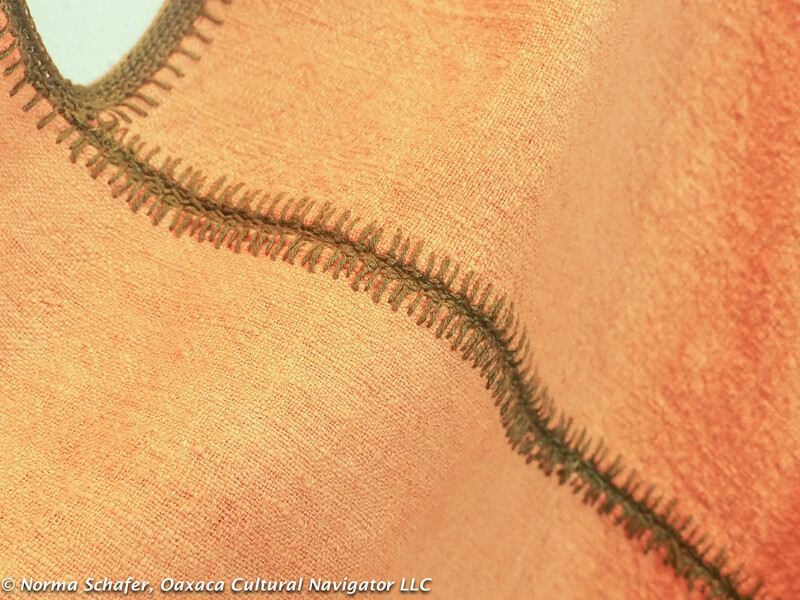 Below, same Orozco style as #4, but with indigo blue dyed threads to add detail of design. One size fits all, $85 USD. 7. SOLD. 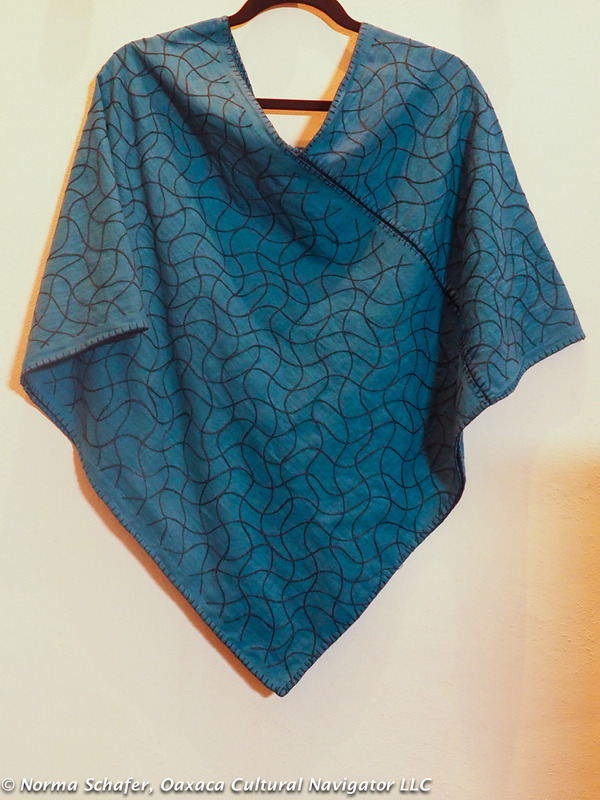 Turquoise quechquemitl, one size, with machine chain stitch detailing, hand-finished seams and hem. From the best shop in Oaxaca, Los Baules de Juana Cata and Remigio Mestas. $125 USD. 7B. 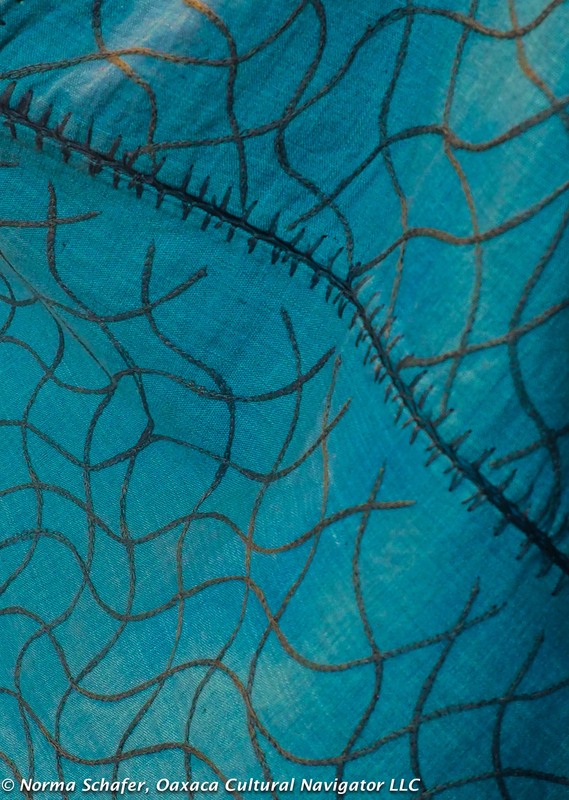 Detail of turquoise quechquemitl. Not discolored, just photo light variations. 8. 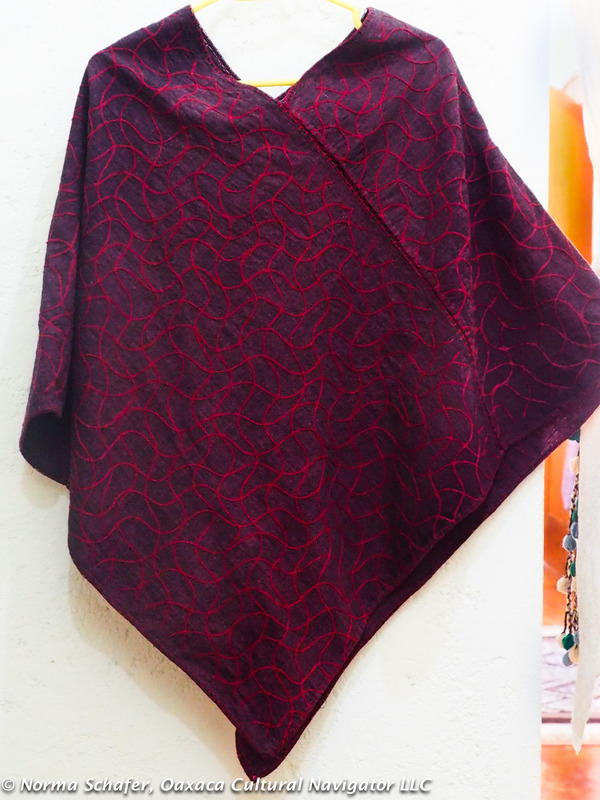 Wine Red Quechquemitl, below, from Los Baules de Juana Cata and Remigio Mestas who personally works with indigenous weavers and embroiderers to make the finest garments. One size. $125 USD. Let me know which one you would like to purchase by number — send me an email. I’ll be going to the USA in early July and will mail to you via USPS after July 7. Thank you very much!